Honda Motor Europe has today announced details of a brand-new model set to make its European debut at Motorcycle Live, the UK’s biggest bike show, which opens this Saturday at The NEC, Birmingham. The CB125F is extensively revised with CB-F family ‘naked’ style plus a responsive new chassis and six-spoke 18-inch wheels. Built for real-world usability, its new air-cooled engine delivers strong low to mid-range torque, and features a balance shaft and revised PGM-FI settings. Build quality is also enhanced, while purchase and ownership costs remain outstandingly attractive. The model’s predecessor – the CBF125 – has long-proved a tough, user-friendly entry-level motorcycle. It has been the UK’s best-selling 125 machine for the past four years and was the best-selling motorcycle in the UK in both 2012 and 2013. The 2015 CB125F is drawn from a fresh gene pool and while it maintains the previous model’s core strengths, it builds heavily on quality, ease of use and a desirable new look. It’s a great bike to simply get riders where they need to be – or from where to begin a lifetime of motorcycling. The CB125F is perfectly aligned with Honda (UK)’s ongoing commitment to welcome and introduce fresh entrants to both the brand and to motorcycling. From its ‘My First Licence’ initiative to its involvement in the industry-led Get On campaign and the launch of the ‘Honda School of Motorcycling’ earlier this year, Honda (UK) is aiming to provide the right initial experience that can lead to a lifelong association. In addition, this year’s Honda (UK) stand at Motorcycle Live will see the introduction of the Honda Hub, which aims to strip back the jargon and provide easy-to-digest expert advice on all elements of motorcycling, from learning to ride, to financing a new machine to organising insurance. 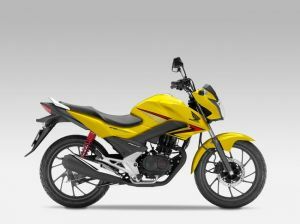 The new CB125F will be on display on the Honda (UK) stand at Motorcycle Live from 22-30 November. Motorcycle Live advance tickets are just £17 per adult, £11 for Seniors and £7 for children aged 11-16 (kids ten and under accompanied by a paying adult go free). To book, call 0844 581 2345 or visit www.motorcyclelive.co.uk. Be sure to follow Honda UK on Facebook and Twitter for all the news from the show.